Yesterday, NJ Gov. Phil Murphy issued an Executive Order directing NJ DEP and NJ BPU to immediately begin the process of rejoining the northeast Regional Greenhouse Gas Initiative (RGGI). The Gov.’s focus on climate change is welcome, but the RGGI move is being blown way out of proportion by environmental groups and the media. So I guess I now must rehash that critique – which I believe is still valid – if only to put all the false praise in context and provide the relevant facts that are being ignored in the media circus. 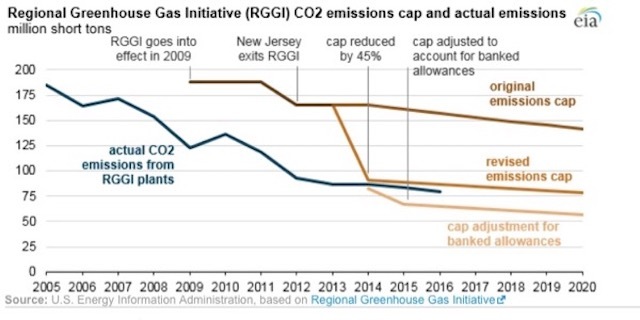 Even though RGGI reduced its [initial 2009] emissions cap [by 45%], actual emissions have remained well below the cap, resulting in a surplus of allowances. In some cases, surplus allowances can be banked for use in future years. However, the availability of too many banked allowances reduces the need to purchase new credits. First of all, Gov. Murphy’s EO on rejoining RGGI provides absolutely no policy guidelines for whether & how deeply NJ’s original emission “caps” (allowances) should be reduced, or how revenue should be used. That’s not leadership, its abdication. Third, if Gov. Murphy views the revenues generated by RGGI (approximately $45 million per year) as a significant “investment in our [energy] future” he is delusional. Transition to a renewable energy future will cost many billions of dollars. To just put that RGGI revenue in NJ budget context, consider that Gov. Christie diverted almost $1.5 billion in clean energy funds generated by the Societal Benefits Charge, almost 30 years of RGGI revenues! 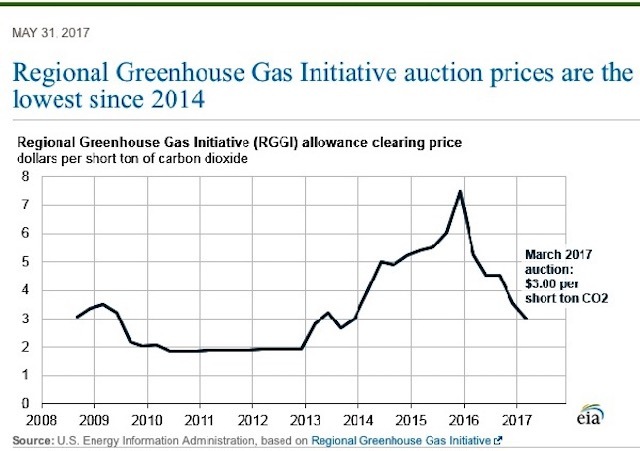 For context on the economic costs of climate change, consider that RGGI allowances sell for $3/ton of emissions, the lowest since 2014. In comparison, economists estimate that the “Social Cost of Carbon” is in the range of $100 – $300+ per ton, while even the federal Office of Management and Budget (OMB) and US EPA estimate $105 – $212/ton. RGGI doesn’t come close to “internalizing the external cost” or addressing market failure, as the economists say, and it isn’t even a down payment! If “our future” is at stake, one would think that we all must “sacrifice”. So, consider that the typical homeowner pays something like 50 cents per month to fund RGGI (data to derive that estimate is from from the Christie NJ Energy Master Plan). Is that sacrifice for investment in our future? That’s certainly no “profile in climate courage” on Murphy’s part. Murphy says the state has forgone $279 million in revenue that could have resulted from participation in RGGI. Money, he says, that could have been used to invest in solar and wind energy and improve air quality. But the allowable uses of RGGI revenues are much broader and provide less benefits than those mentioned by Gov. Murphy – see those uses prescribed in Section 7 of the statute. I am NOT a fan or RGGI for both ideological and policy reasons. “The initial regional cap is 188 million short tons of CO2 per year, which is approximately four percent above annual average regional emissions during the period 2000 through 2004 for electric generating units that will be subject to the program. We must note that what DEP seeks to avoid and describes as “creating dramatic wholesale electricity price impacts and attendant retail electricity rate impacts” were estimated at about a 1% increase in current electric rates – $5.96 PER YEAR, or 50 CENTS per MONTH for a typical NJ household! (see economic analysis on page 72 of DEP proposal). Ideologically, RGGI is a market based alternative to traditional environmental regulation. The program is largely under control of Wall Street and the investment community, with little effective government oversight and virtually no public involvement. It is driven by market incentives, i.e. private profits, and not the public interest. RGGI proponents like to claim that market based trading approaches work, citing the Acid Rain program established by the 1990 Clean Air Act amendments. But what they fail to mention is that those amendments mandated a 50% reduction over a specific timetable and those reductions were enforced via EPA permits. Thus, at best, the acid rain program is a hybrid market – regulatory program. But it only works because of traditional legal mandates and monitoring and enforcement via traditional permits. Finally, what is lost in the protracted RGGI spin and political battles is the fact that when RGGI was enacted by legislature, virtually all NJ environmental groups OPPOSED THE BILL DUE TO SENATOR SWEENEY’s AMENDMENTS. Look at how the major NJ newspaper editorials all lined up against it too. Those Sweeney amendments created loopholes and subsidies. Finally, if you doubt my analysis, watch this YouTube video of 2 EPA air quality enforcement lawyers with over 40 years of experience: THE HUGE MISTAKE (2 veteran EPA enforcement professional whistleblowers). 4. Pursuant to N.J.S.A. 26:2C-52, the regulations promulgated pursuant to Paragraph 3 of this order shall, in addition to the facto s set forth in N.J.S.A. 26:2C-52(b) and consistent with N.J.S.A. 26:2 -51, include specific guidelines for the allocation of funds realized by the State as a result of New Jersey’s participation in RGGI. Such uidelines shall include, as a primary consideration of the State agen ies charged with allocating said funds, factors that will ensure that funds are allocated to projects that will serve communities that are is proportionality impacted by the effects of environmental degradati n and climate change, and which will alleviate the negative effects human health and the environment resulting therefrom. [Update #3: The answer to the legislative reform question is NO. Why stick with the original 2005 MOU? Especially given US EIA data & analysis excerpted above. That “consistent with the terms of the MOU” language means status quo, folks – no emissions cap ratchet down, no deeper emission cuts, no accelerated compliance schedule, no closing of loopholes and subsidies.